Corn planting and weed control delayed by wet field conditions coupled with a major black cutworm migration make black cutworm damage a likely event in the next couple of weeks. Larvae resulting from the current spring flight are predicted to begin cutting corn seedlings by May 29. Late-planted, no-till, and reduced tillage fields are at highest risk. Black cutworm treatment is suggested if 2-5% of corn plants have cutting damage and cutworm larvae are 6th instar or smaller. Seed treated and traited corn should also be scouted as they can sustain feeding damage under heavy population infestations. The WIDATCP Wisconsin Pest Bulletin is reporting high black cutworm captures for a second consecutive week. 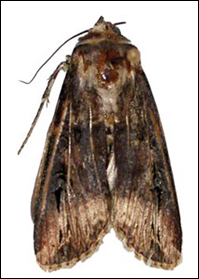 Their network of 34 pheromone traps distributed in southwestern Wisconsin registered another 353 moths, for a cumulative total of 649 moths as of May 15. Black cutworm moth.Egg deposition is now occurring on winter annual weeds (common chickweed, peppergrass and yellow rocket) in no-till and reduced tillage fields. Late planted and no-till or reduced tillage corn fields will be attractive egg-laying sites for the moths now arriving. Larvae resulting from the current spring flight are predicted to begin cutting corn seedlings around May 29. Concerns over damage are greatest during the first ten days to two weeks after corn emergence. Scout fields for early feeding damage and presence of larvae. Focus attention on corn fields which are most attractive for black cutworm oviposition. Black cutworm moths prefer to lay eggs on low-growing vegetation such as chickweed, curly dock, mustards or plant residues from the previous year’s crop. 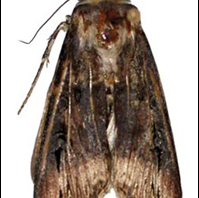 Female moths are partial to soybean residue over corn and wheat residue for egg-laying sites. Heavy spring weed growth, newly broken sod, previous crop and plant debris all increase risk of black cutworm infestations. 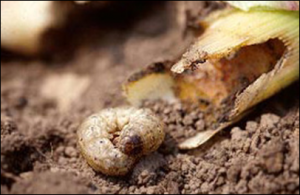 Late-planted corn fields are most heavily damaged during an outbreak of black cutworm because plants are smaller and more vulnerable when larvae are at the “cutting” stage. Initial damage to corn seedlings by early instar black cutworm larvae shows up as holes or irregular feeding injury to corn leaves. Small larvae are not yet able to cut plants and this injury is not economic. However, it does indicate potential for cutting or tunneling into the base of the plant by larger larvae. By contrast, seedcorn maggot and wireworm feeding may also occur early season, but their feeding is confined to lower leaves (first and second leaf) and below ground. Black cutworm feeding damage by small larvae on young corn plant. Black cutworm treatment is suggested if 2-5% of corn plants have cutting damage and cutworm larvae are 6th instar or smaller. 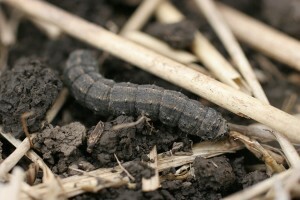 Black cutworm larvae reach the “cutting” stage at ½ -inch length. Corn plants are most vulnerable to cutting until V5. When corn reaches V4 stage larvae may not be able to cut the plant, but they can burrow into the corn plant below ground level.